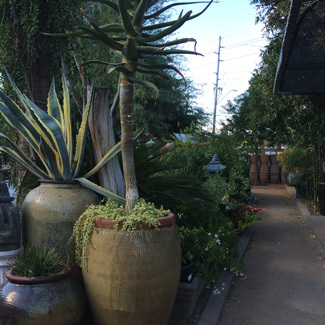 Green Goddess Nursery and Foliage Company has established itself as the only place to go in the Phoenix area for plants, barbeques, pots, fountains and so much more. With over 3 acres of display area and a 700 sq ft greenhouse facilities; Phoenix and the surrounding area has been relying on The Green Goddess since 1977 for plant and tree selection as well as expert help in any of your foliage needs. With 1000’s of pots and fountains to choose from, you are guaranteed to find the one that is right for you. Whether it’s the beautiful Granada pot that comes in different sizes and colors and is styled with stunning fluted edges; or the distinctive Basket Weave planter in a peach color is a beautiful addition on any property. From small planters to large pots the selection at The Green Goddess is the best in the area. The same is true for our fountains, with many different shapes and colors. Whether it is the 3-Tiered Sonoran fountain, the spectacular Blossom fountain or the innovative Ball and Ring fountain; our selection is sure to brighten up any area around your home or business. Pillars, spheres, bird baths, ball cap stones, stone tables, benches and saucers are all on display at The Green Goddess Nursery. Green Goddess carries a complete assortment of grill accessories, from wood chips, charcoal, pizza ovens, steel tongs, meat forks, meat thermometers, spices and seasonings and much more. We also carry the amazing Kamado Joe Grill and Primo Grill; the best grills on the market. No matter what season or whether you need interior or exterior plants, The Green Goddess has a huge variety to choose from. Our team of experts are on site to help you pick out the plants that work best for you and go over care and maintenance needs. We also carry a huge assortment of trees and cacti from the majestic Saguaro cactus to many sweet smelling citrus trees. The Green Goddess offers interior foliage design and installation, with a maintenance program that protects your investment. Our exterior plant experts will not only direct you to trees or plants that work best; but will help you design a spectacular outdoor setting and can install any tree or plants you purchase. All of our products are guaranteed with proper maintenance. Ceramics, fire pits, flowers, garden accessories, lights, metal products, statues and so much more are all on view at our beautiful 3 acre facility. Our friendly and knowledgeable staff love what they do and are available to answer all your questions and help with any products. Please visit us on-line at The Green Goddess to see a complete display of our many products or call 602-971-8110 with any questions or for directions. See you soon!